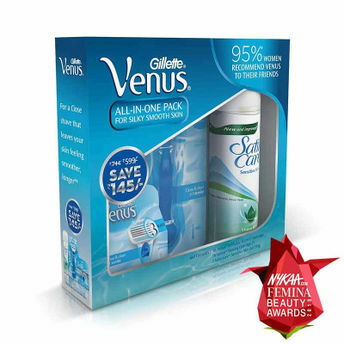 Gillette Venus Razor is the perfect versatile and easy to use razor for women. This Shower safe blade comes with refills which are each sealed separately to ensure that they remain clean and dry, even when stored near moisture. Don’t forget that Venus refill cartridges can be replaced with any Venus refillable system razors! The three blades are engulfed in soft protective cushions that have a wonderful smoothing effect on the skin allowing a safe and close shave. Gillette Venus Cartridge- 2 pack has the speciality of protective cushions around its three blades. Enjoy a smooth, nick-free and perfect shave with the perfect pivoting rounded head and easy access to hard to shave areas; all of it in one stroke. Aloe & Vitamin E. With Silk. This special Sensitive Skin formula contains soothing Aloe and Vitamin E to help decrease skin irritation.